I don't know about you but i can't just walk past a lush store without popping in. It's probably due to the fact that you can smell the store before you see it lol ugh it's so enticing! I picked up these two face masks a few weeks ago and i'm so happy i did. I'd never heard anything about the DLAM face mask prior to purchasing it. The first thing i noticed was the colour and then the mention of murumuru butter and that was enough for me. I was sold! you may be interested to know that this mask is actually vegan, so for those of you that are looking for vegan cosmetics, this is one to add to your list. Ingredients: Glycerine, Kaolin, Water, (Aqua), Fresh Organic Lemon Juice (citrus limonum), Organic Silken Tofu, Rice Syrup (Oryza Sativa Syrup), Grounded White Rice (Oryza Sativa Starch), Rice Milk (Oryza Sativa), Murmur Butter (Astrocaryum Murumuru), Bentone (Hectorite), Colour 42090, Perfume, Grapefruit Oil (Citrus paradisi), Neroili Oil (Citrus Aurantium amara), *Limonene, *Geraniol, *Linalool, *Farnesol. 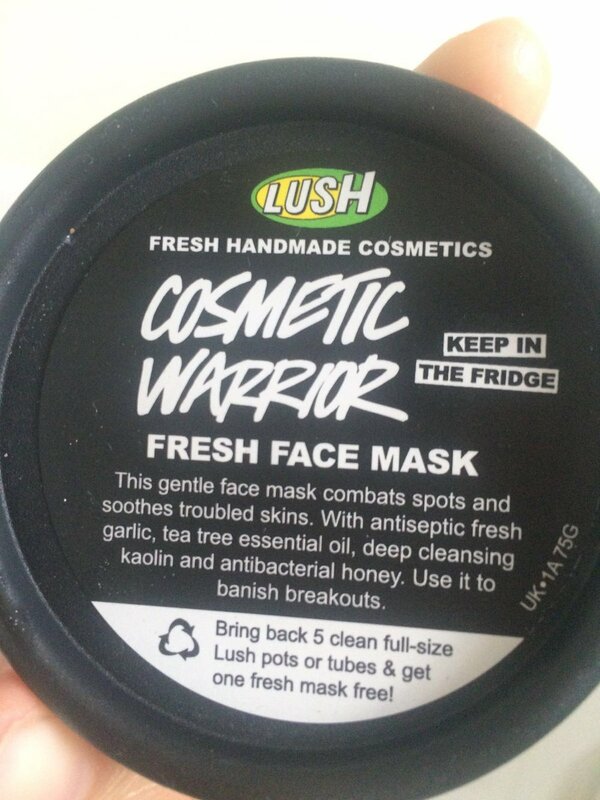 Next up we have... *drum roll* ...Cosmetic warrior! now this is one of the most raved about masks and my curious self wanted to know if it really lived up to the hype. Cosmetic Warrior is mainly composed of honey (moisturising) egg whites (tightens pores), tea tree oil (anti-bacterial) and garlic (anti -inflammatory). And yes, that's exactly what it smells like lol but the smell is faint. It's great for those that suffer with acne-prone/ combination/ sensitive skin. Directions : Slather a generous amount all over your face (do not let the mask dry completely) then rinse off after 10 minutes, followed up with your favourite toner and moisturiser. A few days ago i had a pimple and decided to put CW to the test. I noticed that the redness and swelling had gone down and that was after the first use! The pimple just kept reducing in size with each use, i was surprised to be honest as i didn't expect to see a difference so soon. It's evened out my skin tone and minimized my pores- what's not to love?! I suggest using CW 3x a week. Ingredients: Kaolin, Fresh Green Grapes (vitis vinifera), Fresh organic free range eggs, Honey, Cornstarch (zea mays), Glycerine, Fresh Garlic (Allium sativum), Tea Tree oil, (Melaleuca alternifolia), *Limonene, Perfume. In my opinion, both of these masks are great value for money as i've used them at least 5 times and applied a generous amount each time yet i still have plenty left over. Have you tried these masks? if so, what are your thoughts on them?